JNN 22 Feb 2015 Abuja : The members of the Boko Haram Wahabi Sect are said to have attacked Gaya Village in Hong Local Government Area of Adamawa State in the early hours of Thursday. Investigations revealed that the rampaging terrorists killed 30 indigenes of the community said to be located near the Sambisa Forest. 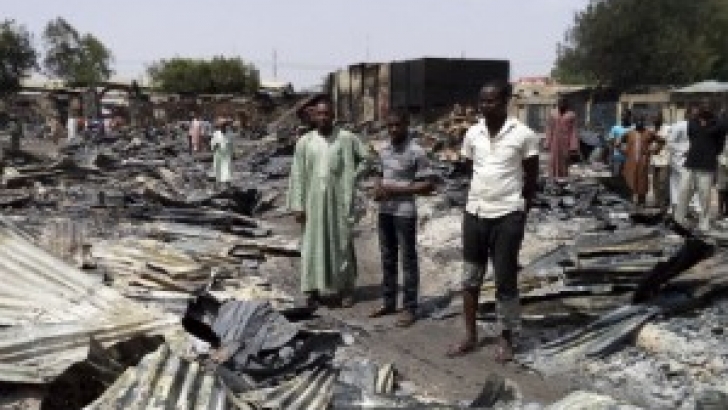 The insurgents were also said to have burnt several buildings in the community before fleeing the area. The attack is coming shortly after the military liberated 11 communities from the terrorists, killed over 300 of them with several calibre of arms and ammunition seized from them on Tuesday. The security source explained that the terrorists who were routed out of their Sambisa Forest training base by the combine team of Air Force and Army personnel operating in the area had resorted to attacking communities that are far away from areas being covered by the military presence. The men of the Nigerian Air Force and ground forces of the Army have been raiding the vast Sambisa Forest since last week in a bid to destroy camps of the terrorists located in the vast forest. It was stated that the terrorists were targeting remote communities without military presence for destructive attacks. The source said, “The Wahabi Terrorists of the Boko Haram Sect attacked Gaya Community in Hong Local Government Area here is Adamawa State. “They killed over 30 people and burnt down several buildings in the community. You know that the community is in the border area just by the Sambisa Forest. “Those who attacked the community were dislodged from the Sambisa Forest by the on-going raid being carried out by the Air Force and the ground troops. “The military is now in control of a large part of the Sambisa Forest and the terrorists are moving in bands and launching attacks on the communities that are far away from the soldiers. The Director of Defence Information, Maj. Gen. Chris Olukolade, said he was not aware of such an attack on any community near the Sambisa forest. This entry was posted in AFRICA and tagged Abuja, Adamwa, Boko Haram, Nigeria, Wahabi Terrorists. Bookmark the permalink.